Due to the Australian International Beer Awards being on in Melbourne, the Local Taphouse managed to wrangle a super-special guest from WA for a super-special Ale Stars session. Brendan Varis, the head brewer of Feral Brewing Company based in Western Australia came to chat about his beer. 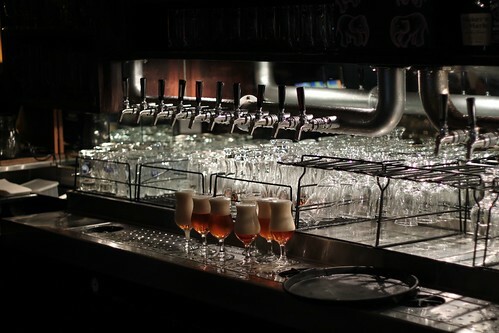 As a result of his presence and focussing on the beer his brewery makes, the Local Taphouse was packed. Brendan was great to listen to – warm, engaging and clearly enthusiastic about what he does. It was interesting to learn that he speaks of Feral Brewing as a brew pub, that is they brew beer for their establishment primarily. Does that mean us outsiders get the ‘offcuts’? As if! 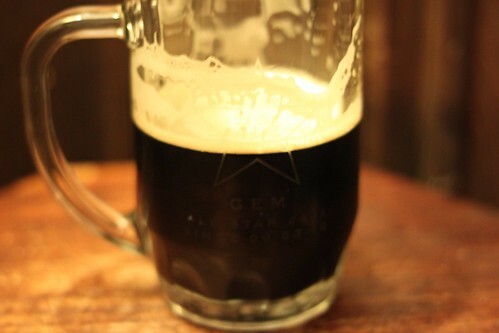 In fact, Ale Stars got a special beer brewed – just for us. In the month prior to this session, I got presented with my Ale Stars tankard and it was christened on this evening – with Bridge Road’s robust porter. If you look carefully, you can see my name on my tankard. Yes yes, small things… etc. I was a little impatient and should have let it warm a little to better taste the flavours. As you can see from my glass, I wasn’t exactly having trouble finishing it. Onto the Ferals. 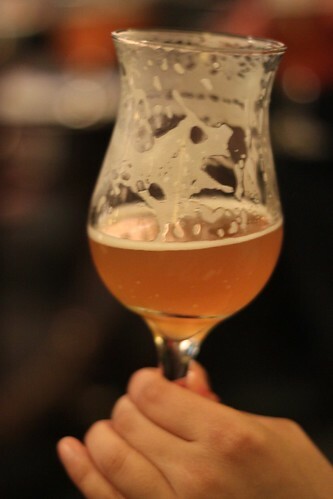 The very first beer of the evening was the iWit 2.0 (props for the playful name) – an imperial witbier with pepper and ginger notes at 7.5% ABV. It is very sweet, uses the same yeast as Hoegaarden, more grain and a stronger wort and five times as much coriander and orange peel (these latter two are characteristic in witbier). Brendan said it’s their flagship beer – the customers love it and it pulls the awards. I’ve said it many times before – this style doesn’t have me leaping for joy, but this is very drinkable. I would absolutely order it again. The second beer was the Dark Funk at 4.7% ABV. Bacteria is introduced (this is not a traditional technique in beermaking) to yeast to make it sour. It’s very much like a Belgian kriek but without the sweetness. The beer is housed in an oak barrel that previously housed white wine (chardonnay) and lactobacillus. The oak has a lovely aromatic of vanilla in it. This beer can take one to two years to be ready though it only spends ten months in the barrel. The barrels are sourced from the local winemakers, of which there are plenty in the region. Brendan stated that normally vintners are quite reluctant to acknowledge wild and/or wine yeasts. This was probably my least favourite of the Ferals tried this evening. My admitting that is probably going to get me booted out of the beer Stonecutters’ club for not being beer nerdy enough. 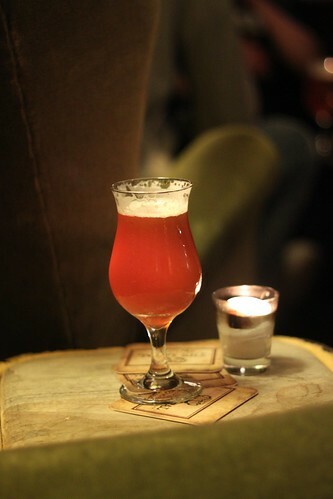 …presented with the last offering for the evening – the Hop Hog, a high strength IPA and thus very hoppy. This is a very American influenced IPA. I have to say that at this point I’m having a lot of trouble deciphering my furiously scribbled notes but it looks like this is modelled on the East Coast IPA which has a strong malt presence (translation: it comes off as sweet and also bitter). This sort of beer, we were told, is best fresh, dry hopped and 5.8% ABV. I loved this because it reminded me of my beloved Fantapants, another Feral brew. I can’t really choose a fave between the Hop Hog and the Raging Flem – loved them both. I guess I could be cheeky and go for the one with the higher ABV… anyway, notes one can supposedly detect are pine needle, citrus and passionfruit. I was pretty chuffed because I could smell the passionfruit first off. Yeah, I still get really excited when I detect notes – scent-wise and taste-wise. I am lost without Shandy’s notes! Are you bored yet? Sorry, I have to jot this stuff down for my personal learning and beery journey. However, you can also read Prof Pilsner’s report here as well as the Local Taphouse’s. I’ll try to get Ale Stars reports up closer to just after the event from now on, promise! 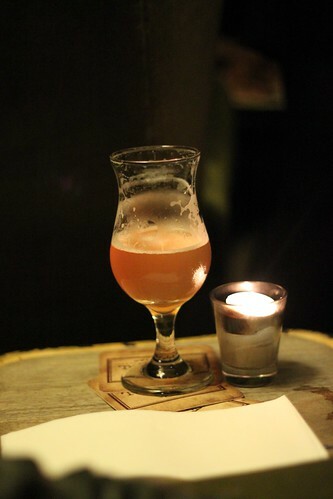 This entry was posted in craft beer goodness and tagged Ale Stars, Australian beer, beer tasting, Brendan Varis, Feral Brewery, St Kilda, The Local Taphouse on June 8, 2010 by gem. 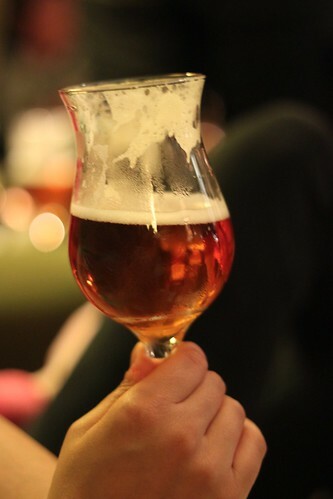 No need to apologies for not liking the sour beer…tasting/drinking/liking beer (or any consumable) is really “everyone to their own”…find what works for you…that’s why there are so many varieties. And I say this because I’m right with you on sour beers, they just don’t work for me…but that’s the nature of the human palate…we’re all unique!The Raging Flem certainly was superb when I had it at The Local Taphouse a few weekends back. Just delicious. Sad I missed out on trying the Hop Hog. Still super keen to one day try Hop Hog and Fantapants.Looking forward to next week’s Ale Stars!! See you there! @James I did like the Ale Stars session on lambics – that was nothing but sour beer! The Dark Funk did put me in the mood for a good kriek, been a while since I had one, yum. Guess I’m just going to have to visit Feral for more Fantapants… 🙂 Wish they weren’t so far away from us! Fantastic even for a non beer drinker like me. Makes me want to drink it all! Almost.